Protect your investment and discover how easy it is to properly winterize your RV and put it in short or long term storage. How much does your RV dealer charge to winterize your RV? Have you ever wanted to take a trip in your RV but canceled it because the RV was winterized and you didn’t want to pay to have it done again? Once your RV is winterized how do you put the RV in storage until next spring? 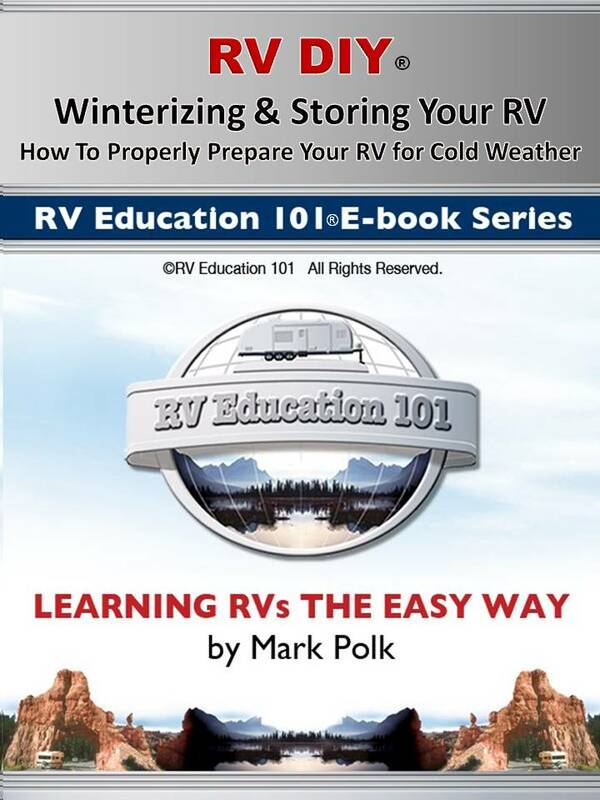 Could you learn how to winterize your own RV? With this "Winterizing and Storing your RV" eBook you will no longer need to be concerned about paying to have your RV winterized or about canceling trips because the RV is winterized . Anybody can easily winterize and store their RV by following the simple step-by-step hands-on instruction. Mark Polk demonstrates how to install a water heater bypass kit to save six gallons of antifreeze. With that done Polk shows you how easy it is to add the non-toxic antifreeze to the water system. You’ll be amazed at how simple it really is and once it is properly winterized you won’t need to worry about expensive repairs next spring when you take it out of storage. A frozen water heater tank that bursts will add up to a $500 repair bill. Winterizing the RV protects the RVs water system, but what about the tires, batteries, generator and other components that can be damaged if they are not properly prepared for short or long term storage. Polk breaks the RV into two separate categories, the chassis and the coach, and walks you through every step required to protect your investment while it is stored. He discusses the do’s and do nots about storing batteries, tires, how to protect the interior and exterior of the RV, fuel preservatives, roof maintenance, sealants, ventilation and much, much more. The cost of this eBook is nothing compared to the hundreds of dollars it can save you when you know what steps to take to protect your RVs water system and other major components.